Lots of robot projects need joystick. This joystick module for arduino provides a affordable solution to that. 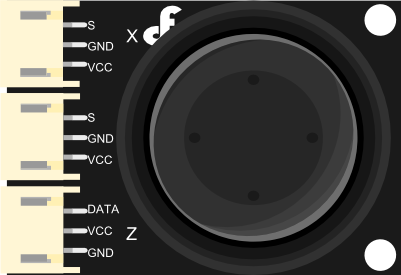 Simply connect to two analog inputs, the robot is at your commands with X,Y control. It also has a switch that is connected to a digital pin. This joystick module can be easily connect to Arduino by IO Expansion Shield For Arduino(V5) (SKU: DFR0088) with supplied cables. Get Gravity: Joystick Module V2 from DFRobot Store or DFRobot Distributor.